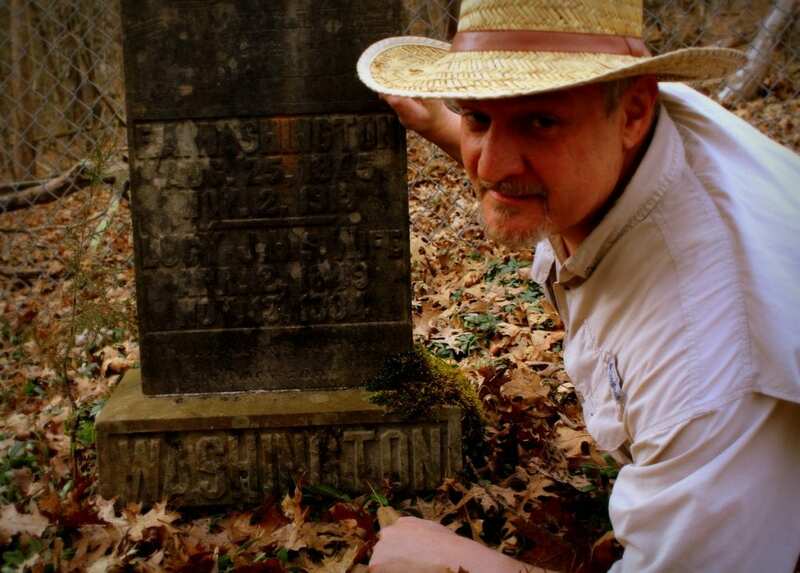 David Sibray examines a Washington family headstone near the mouth of Hurricane Creek in Putnam County. How did a great-nephew of George Washington come to be buried in a virtually forgotten graveyard far from the family’s Potomac Valley plantations? Kanawha Valley historian and environmental geographer Alex Cole says both the cemetery’s illusive past and reasons as to why the landmark is not better known are mysteries he hopes others can help reveal. Francis Augustine Washington, Sr., (1811-1872) and at least four other family members are buried in what’s now the Frazier-Washington Cemetery, obscured among trees on a knoll above Hurricane Creek near its mouth on the Kanawha River in Putnam County. 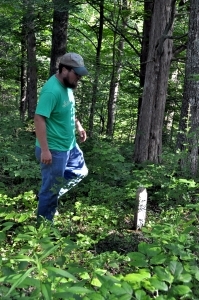 Cole examines a neglected grave. The senior Washington was the son of Lawrence Augustine Washington (1775–1824), a son of Samuel Washington (1734–1781), who was a brother of the president and the builder of Harewood, the Georgian plantation near Charles Town, West Virginia, more than two hundred miles* to the northeast. In 1770, George Washington explored the Kanawha from its mouth on the Ohio up-river some fifteen miles and was soon thereafter awarded thousands of acres in the valley by the King’s proclamation. He also purchased rights to thousands more acres from other landowners. According to some sources, one of Washington’s nephews accompanied him on his adventure into the Kanawha wilderness, but the thread that ties the younger Washington to the estates of his forebears has apparently been broken, if it existed. Augustine’s settlement on the Kanawha might have been coincidence. The rich river bottoms were among the most desirable tracts in the upper Ohio Valley region in the early 1800s, and might have attracted anyone of means. The graves of members of the Frazier family—for which Frazier’s Bottom on the Kanawha is named—stand alongside those of the Washingtons, though both family plots have fallen victim to time and forgetfulness, Cole points out. Shaded by trees and an evergreen carpet of periwinkle, the graves are protected in many ways from the nuisance of a new expressway nearby, though Cole says he’s concerned about possible negative impacts at the apparently abandoned site. Here a tree has toppled, uprooting a primitive headstone in the process; there the lid of a tomb has cracked and chipped, its inscriptions worn illegibly. Though the vegetated state is ideal in many ways, Cole said, he worries about continued neglect. A new gas line built through the cemetery is an indicator of ever-present threats to the unprotected resource. He says the completion of a new U.S. 35 expressway, which by-passes the Kanawha Valley to the south, may help bring tourism into the area by eliminating dangerous traffic situations, an economic circumstance he hopes the graveyard can enhance and influence. *The distance traveled from Charles Town to Frazier’s Bottom would have been more than 400 miles, provided the younger Washington followed the National Road west across the Alleghenies to Wheeling and then the Ohio and Kanawha rivers south. Did a lunatic discover West Virginia? Introducing the five most haunted places in W.Va. Hanging the bloodthirsty Bluebeard of Quiet Dell, W.Va.